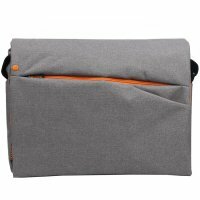 Bag is presented in practical gray textured color. Quick-access pockets provides order and detachable shoulder strap allows multiple carrying options. Main section of the bag is secured by velcro which will keep your laptop safe.